Open-source curriculum to help plan and deliver a Healthy Built Environment workshop! 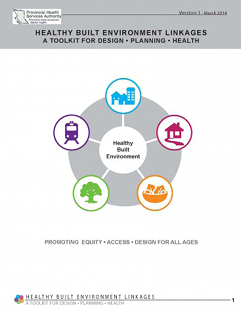 The Healthy Built Environment Linkages Toolkit (the Toolkit) links five features of the built environment (housing, neighbourhood design, food, transportation, and natural environments) with health outcomes. The Toolkit workshops animate and activate the Toolkit by getting people together in a shared learning experience, to explore the Toolkit together by applying it to projects, plans and issues that matter to them in their community or region. Learn more about a healthy built environment. The curriculum includes three detailed agendas, workshop planning guides and corresponding presentations designed for different amounts of time and knowledge levels. Participants will explore the links between built environments and health outcomes and apply their new knowledge to projects, plans and issues that matter to them in their community. Anyone is free to download and adapt the materials to their local context. Build knowledge and familiarity about links between healthy built environment, and the components of the Healthy Built Environment Linkages Toolkit. Develop understanding about the rationale and value of linking healthy built environment evidence and information into projects, plans and initiatives in the community and develop capacity to use the Linkages toolkit to create healthy communities. The intended audience for the workshop includes: community planners, transportation planners, design professionals, decision makers in municipal and regional government, First Nations staff and officials, public health practitioners, and community agencies and organizations whose work focuses on and affects their communities’ built environment. “People are busy!” We have heard that communities and professionals would be interested in leveraging opportunities to work on real key projects and issues in the community, not just abstract or conceptual learning. The workshop uses actual case studies to help participants use the HBE Linkages Toolkit. Getting Started with a Workshop – Ready, Set, Go! Three workshop options of varying durations and depths, to meet different needs are available. 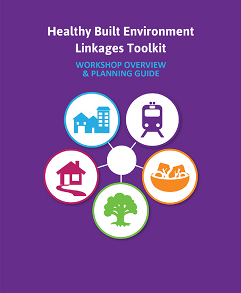 The Healthy Built Environment Linkages Toolkit (Version 1.1, October 2014), which is the subject of this curriculum, is a project of the BC Provincial Health Services Authority’s Population (PHSA) & Public Health team under the leadership of the Healthy Built Environment Alliance (HBEA). The Toolkit and supporting information is available from the PHSA. Related materials for the Healthy Built Environment Linkages Toolkit Workshop Curriculum are available in this section of www.planh.ca to accompany this Guide. All related materials for the Healthy Built Environment Linkages Toolkit Workshop are intended to be open source and modified by workshop organizers to meet their unique needs and objectives. BC Healthy Communities Society and PlanH do not take responsibility for the content and accuracy of modified workshop materials such as presentations and workshop agendas or examples. PlanH, implemented by BC Healthy Communities Society, facilitates local government learning, partnership development and planning for healthier communities where we live, learn, work and play. Working together with health authorities, UBCM and the Ministry of Health, PlanH supports Healthy Families BC, the Province’s health promotion strategy. The HBE workshops, curricula, agendas and slidedecks are free and open source. Choose from three workshops that are customizable for different projects and areas of audience knowledge.